Bloomberg reported the U.S. wind industry installed a record 13.2 gigawatts of new capacity last year. With some 60 gigawatts of cumulative capacity, the U.S. wind industry is now generating 6 percent of the nation’s generating capacity, according to the report. Uncertainty over the extension of the industry’s federal production tax credit (PTC) drove a rush to complete projects before the end of the year. Congress finally gave wind a reprieve with the fiscal cliff legislation that passed December 31. There was something else happening in the wind sector, partially driven by PTC uncertainty, that suggests something much more important for the future of wind. “Mercom tracked approximately $14 billion in 71 announced large-scale project funding deals in 2012,” Mercom Capital Group reported. “$4.2 billion in 22 deals came in the fourth quarter. Most of the funding announcements were for onshore projects. In comparison, large-scale project funding announcements in 2011 came to approximately $11 billion in 52 deals." That is just part of the story. 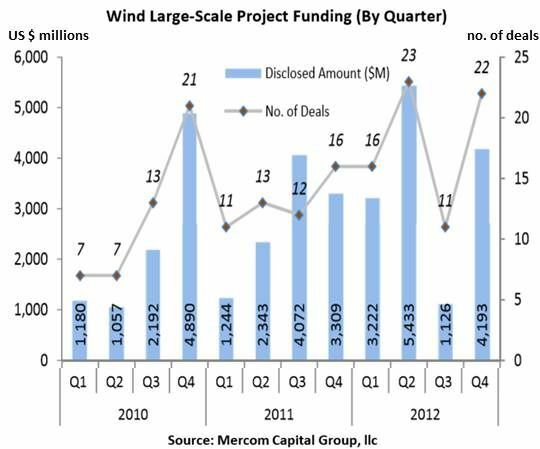 Mercom’s numbers show 58 large-scale project fundings for all of 2010 and a Q4 peak of 21 fundings. The 52 fundings in 2011 included a one-quarter peak of 16 fundings in Q4. No other quarter saw more than 13 fundings. The 2012 jump of more than 36 percent in large-project fundings saw sixteen fundings in Q1, twenty-three in Q2, eleven in Q3, and twenty-two in Q4. The fundings were worldwide and were shared by major international banks across the globe. 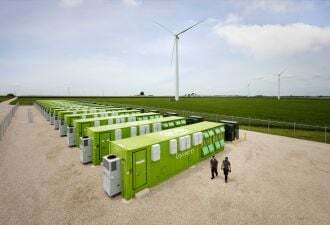 One of 2012’s top five was the 300-megawatt Alta Wind VII and IX undertaking in California, funded by the Bank of Montreal (NYSE:BMO), Canadian Imperial Bank of Commerce (NYSE:CM), Key Bank, KfW IPEX Bank, Santander, Sumitomo, BayernLB, DZ Bank, Associated Bank, Mitsubishi UFJ Financial Group affiliate Union Bank and RBS Securities. 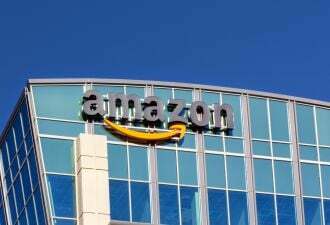 The other fundings in the top five were in Canada, Belgium, the U.K. and Germany, and were funded by an array of multinational banking giants. The top five funders were Union Bank, EBRD, KfW IPEX Bank, JP Morgan (NYSE:JPM) and Rabobank. 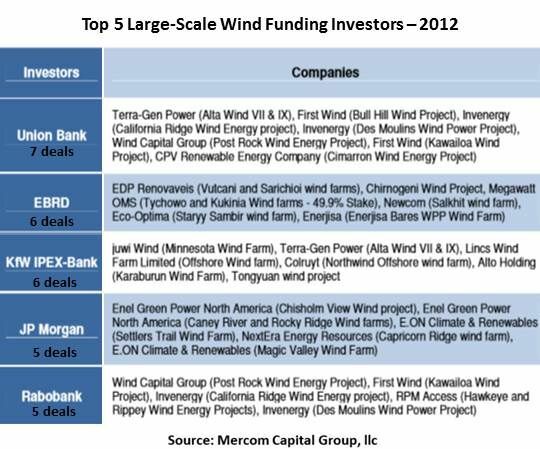 Five of Q4’s fundings were of U.S. projects, and two of the top five fundings in Q4 were U.S. projects, E.ON Climate & Renewables’ 203-megawatt Magic Valley Wind Farm funded by JP Morgan and Wells Fargo (NYSE:WFC) and Duke Energy (NYSE:DUK) Renewables’ 402-megawatt Los Vientos I and Los Vientos II Wind Farm funded by North American Development Bank. What is important to note is that builders didn’t run short of buyers. They had almost as many buyers in Q4 as they did earlier in the year. 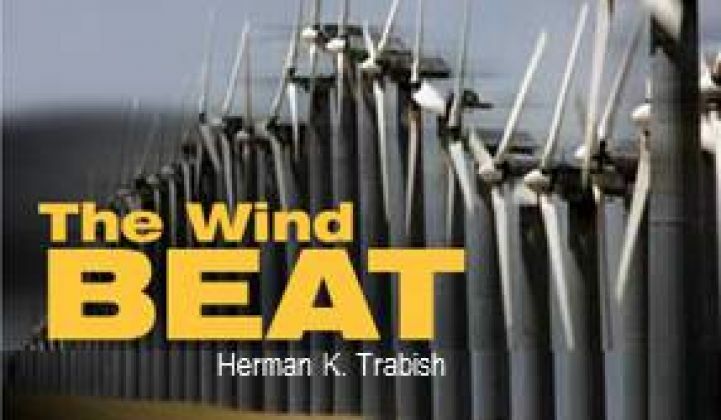 Despite chattering in the media and on the web by wind’s would-be saboteurs about high costs, the marketplace adamantly proclaimed wind a good buy in 2012.